Everest Base Camp is one of the most popular destinations to travel to. It gives you the most glorious view of Mount Everest, also known as the roof of the world. Everest Base Camp from Nepal or Tibet has its own unique and distinct feature. The experience of walking to the Everest Base Camp is entirely different. Tibet Everest Base Camp is completely a different journey. The landscape is quite different and in many ways interesting. The roads are also smooth making your trips a lot easier and comfortable. To reach Tibet Everest Base Camp, the journey starts from Lhasa. It takes 3 days to reach there on a ride. Tibet is a high altitude plateau region. It has an elevation of 4000 m surrounded by it on average. Both Nepal and Tibet have the magnificent Himalayas. Tibet has its own uniqueness and is popularly know for Tibetan Buddhism. It is majorly because of the spread of Buddhism. It was because of the kings Tsrong Tsan Gampo and Tri Sen De Chen and acharyas like Atisa, Nagarjuna, Guru Rinpoche and many more. Tibet has many Buddhist monasteries that follow the Tibetan architecture. So, Tibet is very rich in its own culture. Likewise, though Nepal is the birthplace of Buddha, it has gone through a specter of religious, political and social turmoil. This has resulted in a fusion of Indo-Aryan and Tibetan-Mongolian culture. With the Sherpa community and the mani walls, the ambiance at the Everest Base Camp reflects the influence of Lamaistic Buddhism. Mount Everest is within the Sagarmatha National Park in Solukhumbu. Whereas in Tibet, it is in Qomolangma National Reserve in Tingri County, Shigatse. Tibet is also famous for many plateaus. It is very clear in the topography map because of its boot-like feature. Mount Everest is also known as Sagarmatha in Nepal whereas, it is Qomolangma in Tibet. The Everest Base Camp trek in Tibet is North Everest Base Camp, 5200m while the one in Nepal is South Everest Base Camp, 5364 m.
EBC from the Tibetan side is a beautiful Shangri-La, the mythical Himalayan utopia. 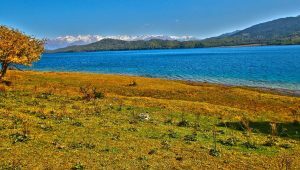 You will also witness Namtso lake and the sacred Mount Kailash in the northern Grassland. The landscape is quite different and a lot challenging to trek from Nepal. You can, however, enjoy spectacular views of a lot of mountain vistas from this side. In Nepal, the wind comes from the Indian Ocean. Due to this, there is more rainfall there and the air is humid as well. Thus, the natural band spectrum is more complex. But in Tibet, the area is less influenced by the ocean. So the area is dry and filled with scarce plants. On the way to North Everest Base Camp, the hills are browner because of the drier climate. On the south, it is a bit chillier so more snow-capped mountains can are visible. It takes at least 18 days to reach the North Everest Base Camp. But you can always adjust the itinerary as per your schedule and comfort. The trip starts from Lhasa. And the route takes to Qushui. Followed by Lankazi, Gyantse, Shigatse, and Lhatse respectively. 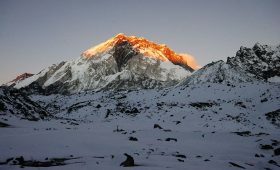 From Lhatse you will head towards Dingri and then reach the North Everest Base Camp. It is convenient to fly to Lhasa from Kathmandu for easier access. 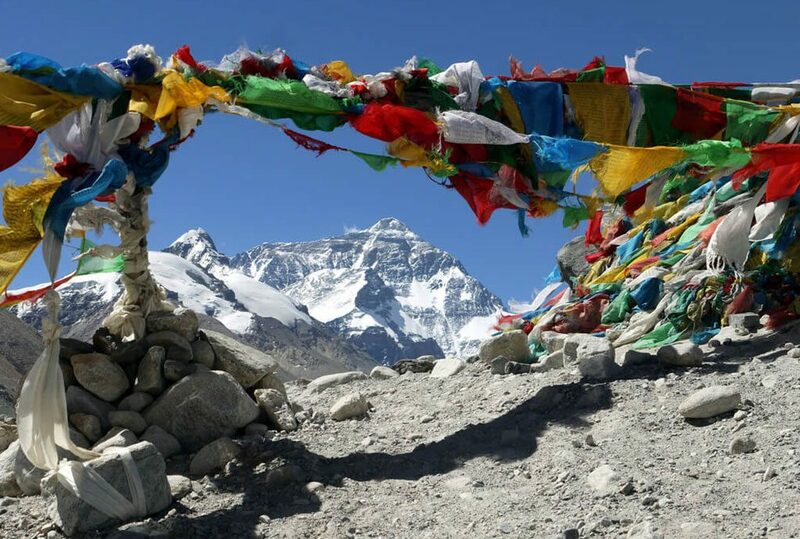 The Everest Base Camp of Tibet is more than 5000 m high through the Qomolangma National Park. You will also cross the world’s highest and largest plateau in Tibet. You can either choose to go from road vehicles or choose a helicopter ride. There are many routes through which you can reach the Tibet Everest Base Camp. You can find trains from the Chinese cities like Beijing, Shanghai, Chengdu, Guangzhou and Xining to reach Lhasa. These days there is asphalt highway to reach to Tibet Everest Base Camp from Lhasa. The North Everest Base Camp is about 4 km from the Rongbuk Monastery. It is also the highest Buddhist shrine in the world. Tibet Everest Base Camp is at the foot of Rongbuk glacier. It takes about 14 days to reach the South Everest Base Camp. The schedule and itinerary can be easily adjusted as per your comfort. The trip starts from Lukla. You will then go through Phakding, Namche Bazaar, Tengboche, Pheriche, and Lobuche respectively. The last stop will be at Gorak Shep before reaching the South Everest Base Camp. To reach there, you will go through Namche Bazaar and finally climb up to Gorak Shep. It is not possible to go to Nepal Everest Base Camp through the motorable road because of the rocky terrain. You have to either trek or go through a helicopter. From the helicopter, you will first go to Lukla from Kathmandu in a 25 minutes flight. After that, you will go to Everest Base Camp Nepal on a helicopter. The helicopter will take you to Kala Patthar and then the Everest Base Camp Nepal. 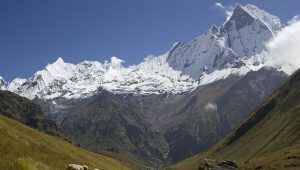 You will then get to explore the Base Camp and also the Khumbu Glacier. On the way back, you will get to see the Mt. Nuptse, Lhotse and the beautiful Ama Dablam. 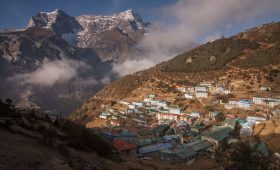 Trekking will take you to Namche Bazaar from Lukla. It is either in the 3rd or 7th day when you will be in Namche Bazaar. It is also the first acclimatization spot. 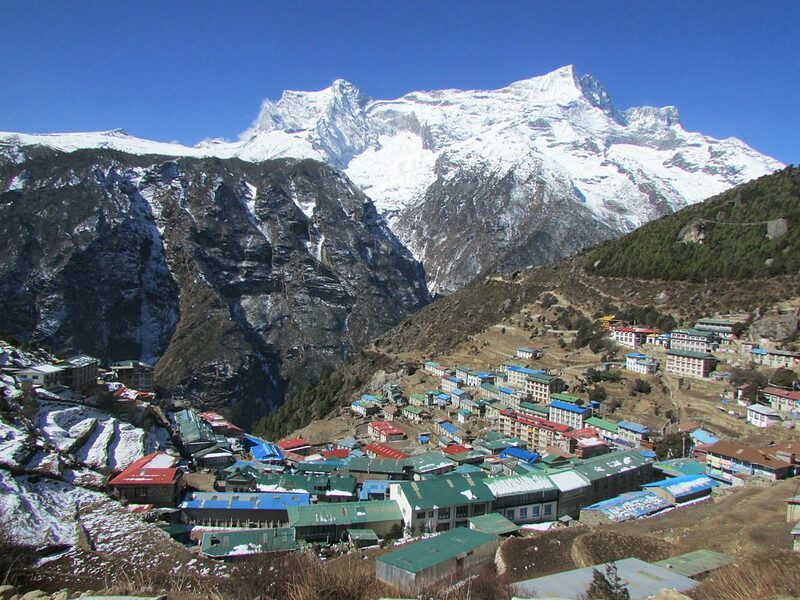 Namche Bazaar is popular for the Sherpa community and is also a spot for acclimatization. You will also pass through Khumbu glacier which is also the highest glacier in the world. After Namche Bazaar, you will trek towards Gorak Shep. 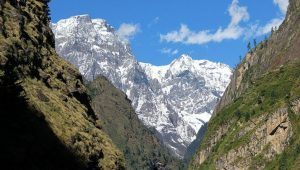 You will pass through Tengboche and Dingboche to reach Gorak Shep. Then you will walk to the Everest Base Camp Nepal followed by a trek to Kala Patthar. The North Everest Base Camp is more challenging. These details come from the experiences of the trekkers and the geographical conditions. The route does not include challenging passes and glaciers like the Khumbu Glacier of Nepal. Yet, the view is more specific from Tibet because there aren’t other mountains around. 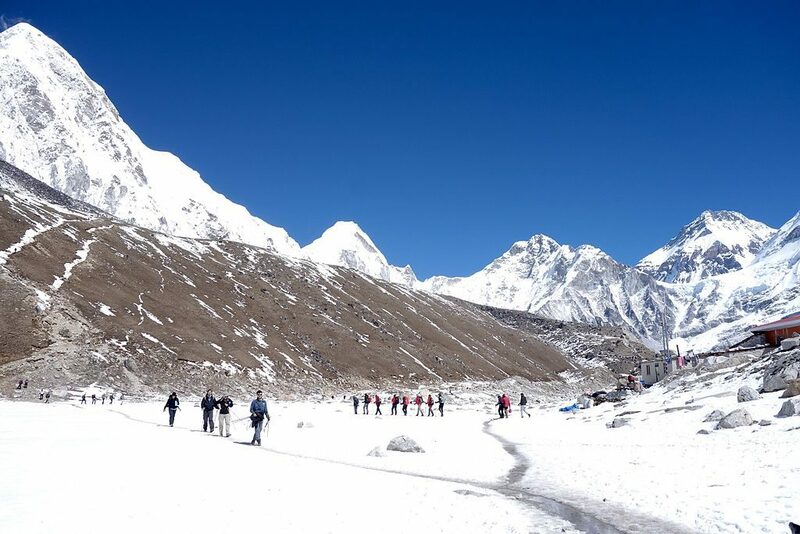 Adventure-seeking trekkers appreciate the North Everest Base Camp route. It is a lot more challenging and does require more trekking experience. It requires strength and tolerance for this purpose. The difficulty is moderate for the South Everest Base Camp. The slopes are also less steep which makes it easier for the Mountaineers. Also, Nepal is more commercial for mountaineering. Nepal is also more developed from the context of tourism. This has made trekking from Nepal a lot more comfortable too. Likewise, beginners with no trekking experiences can comfortably choose to trek from Nepal too. A majority of trekkers choose the expedition from the South Everest Base Camp. 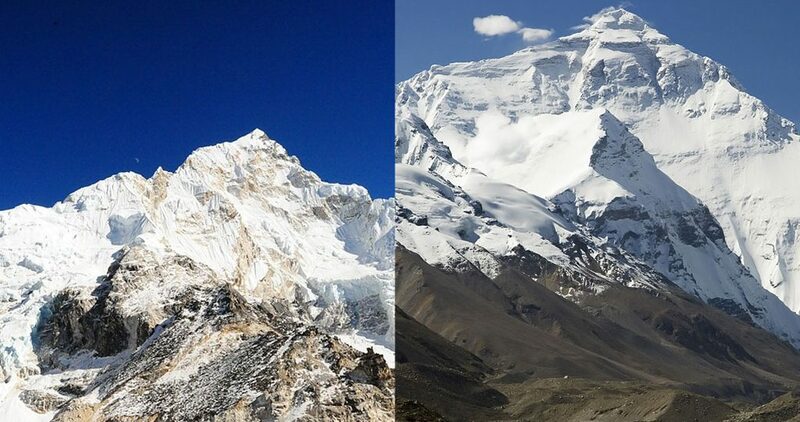 The peak season for South Everest Base Camp is spring (March, April, May) and autumn ( September, October, November). You will experience more rain during the mid-June to August. For mountaineering, the best time is April to May. During spring, the climate is moderate so the temperature is warmer and there is very little chance of rain. But you need to make your reservations in advance because the hotels can be fully booked in this season. September to November is also high season for Everest Base Camp in Nepal. The views of the mountains are clear this season. The heat is less so the trekking will be enjoyable. But there is a risk of rain in the lower elevation and snow on the higher elevations. But the weather is more like to support your journey at this time. June to August is the time of monsoon so the tracks are muddy. The view will also be less clear and the rain brings leeches on the way. On time between December to February, it is colder. The temperature is freezing and there are chances of heavy snowfall. Also, the days are shorter so it will be harder to trek. The best time for Everest Base Camp Tibet is April, May, June. The temperature rises and gets warmer at this time. The difference between these seasons is comparatively similar. The days are longer and the nights aren’t that cold as in the winter. The flowers bloom with joy and the grasslands turn rich. Both of the times are perfect for tour and mountaineering. The warm sun and picturesque view are beautifully supported by fresh air. The visibility is great and the Everest Base Camp appear multicolored. These can be very visually appealing for the travelers. When it comes to the view of Mount Everest, Tibet wins. The majestic Mount Everest stands alone and tall and like its ruling the world. There aren’t other neighboring mountains while sightseeing. 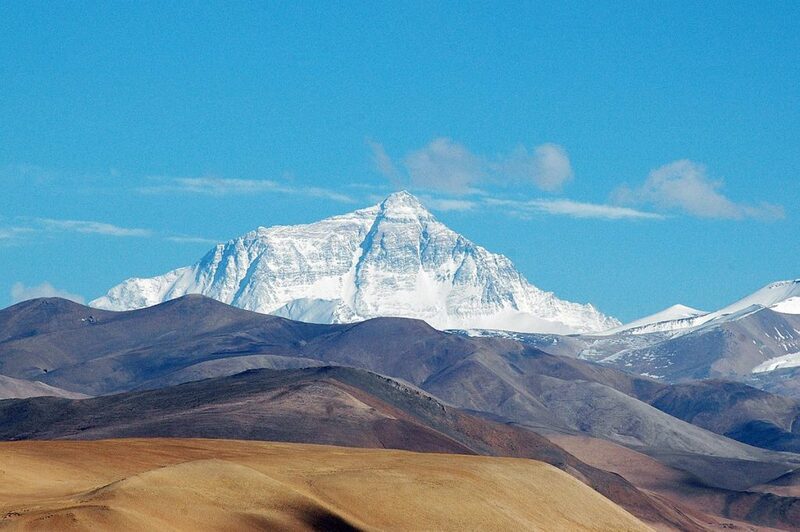 You will see the Mount Everest’s north face from Tibet. The view is closer and clearer. But you will also get the chance to witness other mountains as well. The mountains that are visible are Makalu (8463m), Lhotse (8516m), and Mt. Everest (8844.43m), Cho Oyu (8201m) along the Great Himalayas at Gawu La Pass(5198m). You will also walk your way to the beautiful monasteries and plateaus that Tibet is popular for. Rongbuk monastery is the highest monastery in the world. And the highest plateau is also in Tibet as well. There are many mountains you can see in the trek to Everest Base Camp of Nepal. You will see many mountains from Dingboche. Some of them are Lhotse, Makalu, Cho Oyu, Cholatse, Taboche, Lobuche West and Lobuche East Peaks. 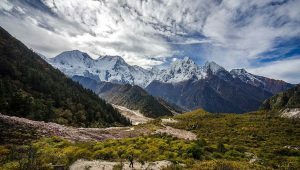 Khumbu Glacier, Khumbutse, Lingtsen, Pumori and Mahalangur peaks are an addition to scenic beauty. Seeing small villages from a distant height is also mesmerizing. You will also witness Ama Dablam, the most beautiful mountain in the world. But the views are less clear because of other neighboring mountains. The presence of varieties in mountain somehow disrupts the distinct view of Mount Everest. You will enjoy each and every view nevertheless. The hotels are widely available in Lhasa. The facilities are also very good. But the guest houses can be a bit disappointing because they are normal standard only. There are varieties of local foods available. You will have a taste of Sichuan, Cantonese, and authentic Western dishes. The hotels also have Tibetan crafts. In the higher altitude, you will have pancakes and yak butter tea. In the Base Camp area, there are very little electricity and water. The bathrooms aren’t special but are convenient enough. The guest house serves you with simple breakfast. It also has 24 hours hot water service so that is a plus point. You can enjoy warm and comforting food throughout the trip. Nepal is a tourist eccentric county. Nepal has lots of guest houses and lodges available in the checkpoints. The guest houses are pretty standard but the facilities are really convenient. During the peak seasons, crowds are inevitable. Everest Base Camp in Nepal is also the preference of most of the fellow trekkers and mountaineers. Because of this, it is very important to make your reservations early. And, sleeping bag is necessary because there aren’t normal bedding. You will have dal and bhat most of the time but these days there are varieties of food items available. Everest Base Camp Tibet is less crowded than that of the Everest Base Camp Nepal. The area is more popular during the summer. And the tour is possible in road vehicles as well. When it comes to the preference, people who have less time or only want to enjoy the view choose Tibet. The Everest Base Camp Tibet is popular for the monasteries and plateaus. Tibet has the world’s highest monastery, Rongbuk Monastery. Tibet also has the highest plateau in the world. Other than that, the clear and close view of Mount Everest is another reason why Tibet is popular. So people who are very eager to see the Everest up close choose this route. South Everest Base Camp can be very crowded because of its popularity. During peak seasons you could face problems with food and accommodations if you do not pre-book. The reason why Everest Base Camp Nepal can be so crowded in the peak season is that of many reasons. The tourism sector is one of the main focus here. Due to this reason, the paths are well constructed and the accommodations are well facilitated. The peak season is also crowded because Nepal has more reliability in trekking. People also choose this route because the geography is also perfect for trekking. Trekking through Tibet requires a special permit and trekking or traveling alone is not permitted. In fact, a travel permit is the most important thing to go through Tibet Everest Base Camp. You need three kinds of permits to go to Base Camp. The first is the Tibet Travel Permit to enter Tibet. The second one is the Aliens’ Travel Permit and the third one is Frontier Pass. Among them, the Tibet Travel Permit is necessary to enter Tibet. These are available by the local travel agency. The travel agencies will also give you the details about when these permits will be necessary and their validity. Everest Base Camp trek in Nepal also asks for certain permits. You need a Everest Regional Area Permit and Sagarmatha National Park permit for this trek. The regional permit issue can be in Lukla only. For the Sagarmatha National Park permit, you can issue it in the entrance. You can also get these permits in the Tourism Board, Kathmandu. For the permits of conservation areas, you will need your photos as well. During the peak seasons, the cost can get high. But during the closing season, it will be cheaper. These all are the costs of the vehicle from Tingri to the Everest Base Camp. Accommodation costs will be about NRs. 2542 to NRs. 50000. These will all be on the basis of your personal and the seasonal charges. When it comes to the entrance fee, they are of two kinds. They are for foreigners and for SAARC countries. They cost NRs 3390 (USD 32.73) and NRs 1695 (USD 16.37) respectively. But the entrance fee is free for children below 10. If you choose to take a helicopter ride it costs around NRs 133738.50 (USD 1175). The accommodation costs about USD 1000 to 3000. Everest Base Camp Tibet vs Nepal have their own typical adventures to offer. If you are running in a tight schedule then choose the North Everest Base Camp. From Tibet, you can see the view clearer. You are not surrounded by other mountains making Mt. Everest the spectacular one. Everest Base Camp from both the sides is absolutely amazing enriching with its unique beauty. For further queries and detailed information, please contact us. We are at your service and are happy to guide you through.